A study from the life in Ching’s inimitable highly-finished style, this is also a strikingly decorative work which, in the placing of the bird on the paper and the expanse of untouched ground, has much in common with a painted Japanese screen. A sense of movement, volume and texture is created with masterly sureness of touch, and the range of tone is exceptional for a work in pencil. Raymond Harris Ching was born in New Zealand, and began a career in advertising at the remarkably young age of twelve. By the time that he had risen from apprentice to art director, his dissatisfaction with his work was strong enough to propel him into a second career as an artist. 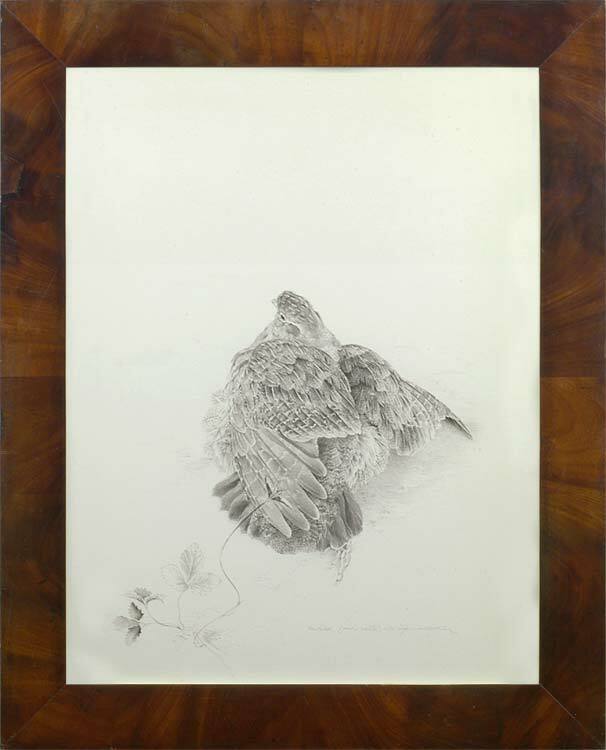 He was particularly drawn to painting birds, exhibiting pictures of these from his twenties and capturing the attention of the head of Collins, the publishing company, Sir William Collins. Sir William needed illustrators for his bird books, and Ching moved to Britain to begin work on this project, but was instead snapped up to illustrate The Reader’s Digest Book of Birds – an outstandingly successful book, which went into many editions. Ching moved to the Cinque Port of Rye; he continues to paint birds in both oils and watercolour, as well as landscapes and portraits, and has also produced some imaginative works containing birds and figures.